Already a long time ago, I posted this on the Innovation web site, because there was a little mystery why we didn't hade enough raiders. It consist of two parts, the first being the original post. And then a second part, after we had some discussion on forum/guildchat about who was coming. There was a large gap between people being invited iirc, and people actually still playing. Because the forum is being replaced, I save it here (it was the original purpose of the blog). Although I might just do this again on the current raiders in september, just to see the difference. My expertise on numbercrunging has been called upon. with the recent cancelled raids and forced 10-mans, there seems to be a problem in the guild considering availabilty of people. Note, I say availabilty to raid, not actually raiding. When I applied for Innovation, I read that Innovation raided 3 days, and you where expected to turn up at least two. That's something I will take as a basic for the next couple of paragraphs. Every raider in Innovation should be available to raid 2 days/week. Before I continue, I know real life happens, but normally speaking, there are also people who are available almost all the time, so a little lee-way is already here. 3 raids of 25 man equals 75 raidspots/week. If everyone is available 2 days that week, we end up with 75/2=37.5 raiders to make sure we actually have 25 men each night. This same reasoning can be applied to all 4 classes. And because this is Innovation, I will be rounding up a bit. In the end this will lead to 40 active raiders. I will also use the base of 2 tanks/6 healers/16 dps for every raid. 3 raids times 2 tanks is 6 tankspots/week, 6/2=3, so Innovation needs 3 tanks to function properly. But... 3 is low. It actually means that if 2 tanks can't make it (a real possibility), we can't raid. Adding an extra tank would probably solve this (at this moment preferably a Tankadin, because we don't have it), but it is not really needed, we luckily have some plate-dps able to tank very well. 3 raids times 6 healers gives 18 healingspots/week, 18/2=9, so 9 healers needed. At the moment we have 10, which I actually consider a little bit better then 9, because of the same reason as with tanks. A little extra buffer is not bad. And if needed, some can go dps for a night. 37 raiders- (9+2)=25 dps left to fill up the roster... we have 24, so one short. But with dual-spec this could be handled. So, actually... there should not be a problem...And yes, there is a little difference with rounding, but I'll take care of that later. This current number actually has a logical conclusion: If we have to cancel so many raids (or downtune), Innovation-raiders are NOT available 2 days/week. So, with this information, I changed the numbers a bit. I tried to figure out the best raid-member-configuration. And I made a graph. With these simple rules, we should need 40 people, giving the chance for fifteen people not to be online. Seems an high enough buffer. 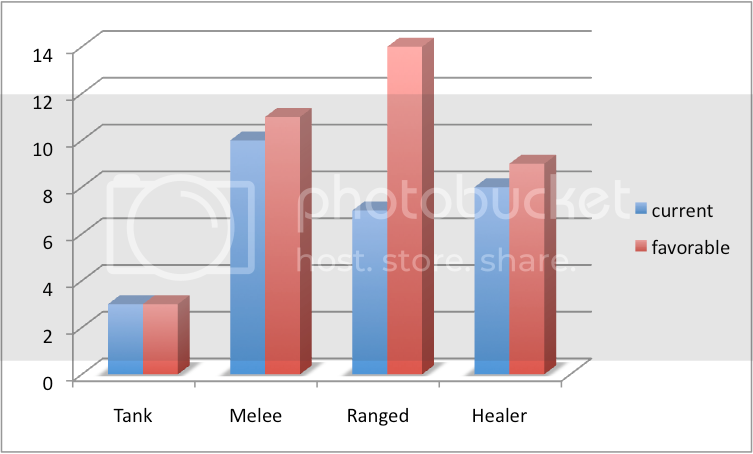 Now the numbers of melee and ranged can be mixed a little bit considering availabilty. And the question is, do we need another tank? But looking at both graphs, I can make a (and againa simple one) conclusion. We could use 1 more tank (preferable a tankadin), one more ranged (preferable an elemental shaman) and one more melee (deathknight or enhancement shaman), although the latter could also be a ranged (shadowpriest or warlock) considering the unfriendly-ness of current raids towards melee. If any raider should quit, a replacement should be looked for in the lowest column. E.g. if a mage quits, don't get another mage, but try to get a warlock. So with all these numbers an end-conclusion is reached, and an actual plee to my co-raiders. Innovation has the numbers to field 3 25-men raids/week. A little extra buffer couldn't hurt. See the possible recruitlist above, although getting any extra DPS at the moment would also not hurt the number of not-cancelled 25's. But.. It's not what Innovation can do for you, It's what you can do for Innovation. Oh, and one other question, all 37 raiders got an invite to next week (not the alts). How long does it take to actually hit accept/decline (or tentative if you are not sure). Disclaimer: The long text above is largely mathematical, and there will be different opinions by others, at least I hope so :p, I ain't the almighty numbercruncher. All opinions are my own, and only my own. I am not an officer, just a fellow raider who wants to raid 25. So, after some recent info, I went back to the crunching. I now looked especially at who accepted an invitation last 2 weeks (7 raids), and went home with that. Two things. First, to Kris, I now what you typed, but I looked at who accepted, which means even with erratic availabilty I have 8 healers. 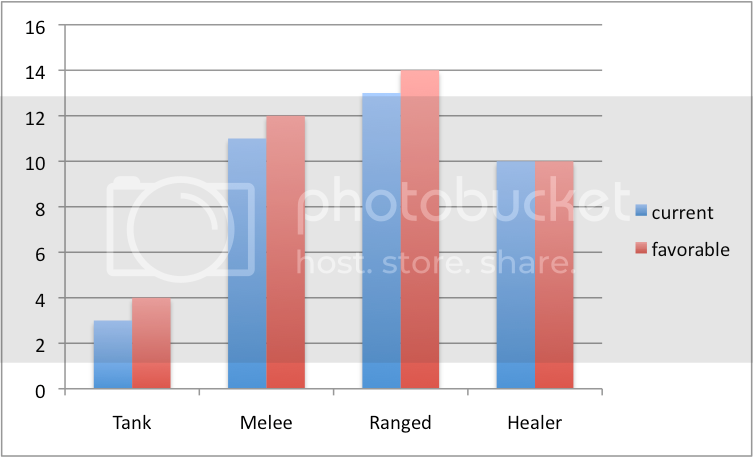 Secondly, because I looked at actual invites, I lowered the favorable numbers of Healing, Tanks and Melee with 1. I also took out recent leavers, and added one Retri-paladin (namely Sponchebob, and welcome by the way :p), this way I removed 10 names from the list I use, and added 1. Well... that is a complete different viewpoint... although an extra Melee and Healer wouldn't hurt.. the problem lies with Ranged. Last two weeks only 7 ranged actually accepted an invitation. Which is half of what we actually need. 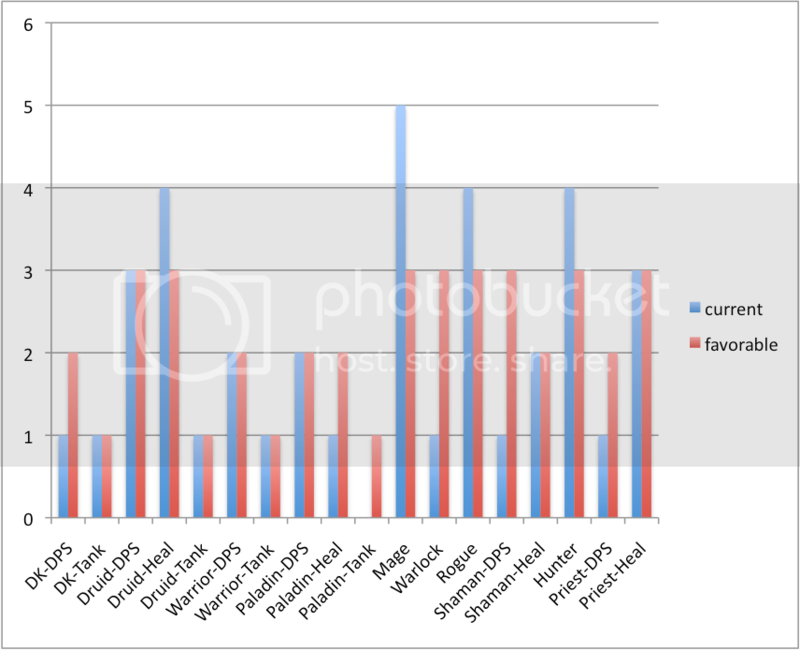 Looking at the graph, we probably need to find 10 more players, luckily, most of them are DPS. Looking at it from another point; Over the last two weeks we had an average of 19 people signing in. That's 6 raidspots low, which are 18 spots/week, which again with an average attendance of aroun 67% would mean 9 more people are needed. Because I also know there are some people coming back shortly (due to RL getting less hectic, or other reasons), I would say, get 9 more people...1 healer, 8 dps. Actually, another Druid-Dps would also be a posibility... if we weren't swarmed with druids at the moment. REMINDER: This is archive-material, so no longer the case, any numbers above ar out of date..
especially considering we have Monks now.